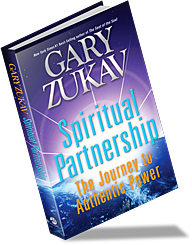 Oprah has featured her friend Gary Zukav on The Oprah Winfrey Show 34 times. In 2007 Oprah invited Gary to help her inaugurate her new Soul Series on satellite radio. Listen to an excerpt from their most recent discussion. Gary will show you ways to look at all your relationships—with children, spouses, partners, coworkers, and others—that may be 180 degrees different from the way that you have thought about relationships in the past. Join Gary and Oprah for this life-changing, relationship-changing interview!